When working with databases that contain a large number of objects, sometimes it is hard to navigate through them and to find the objects that are currently in need. 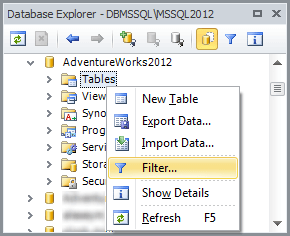 The Filter feature, presented in dbForge Studio for SQL Server, is meant to simplify the work with large databases by sorting database objects in accordance with certain criteria. In this article, we will show how to create a filter, allowing to locate all tables, containing the word "Employee" in their names. In Database Explorer, right-click an object category node (for example, Tables) and select Filter from the shortcut menu.The Filter Settings dialog box will appear. In the Property column, select the required property (Name, Schema or Owner) from the drop-down list. In the Operator column, select the matching type of the filter syntax (Equals, Not Equals, Contains, Starts With, Ends With) from the drop-down list. 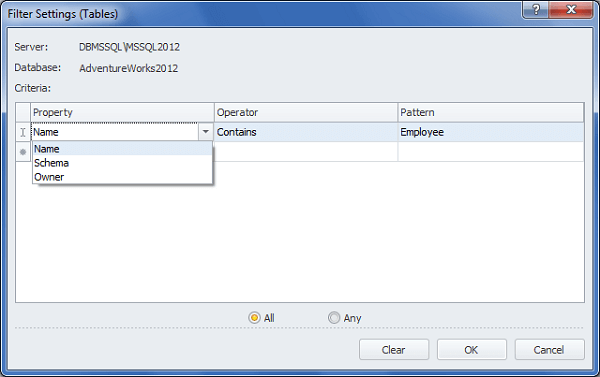 In the Pattern column, enter the full or partial syntax of the property or properties you want to apply to a filter. Select All or Any to make a filtered object comply with all or any criteria. 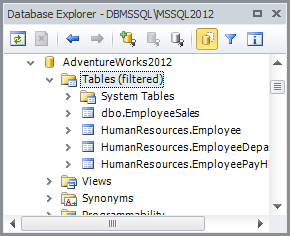 When a filter is applied to a certain database object category, it is labeled as (filtered). 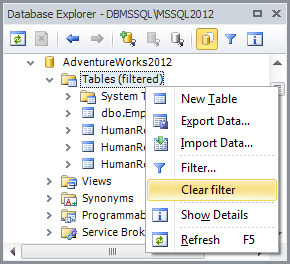 The Filter feature of dbForge Studio for SQL Server enables a quick navigation through database objects. By setting the proper sorting criteria for a filter, you can find the required information in a wink. With dbForge Studio for SQL Server you can sort almost all database objects, including Tables, Views, Procedures, Triggers, Functions, Users, Roles etc.